For a lot of marketing and operations executives or financial controllers, it is normal to start questioning the recurring expense of SEO, especially if it has gone on for what may be perceived to be an extended duration. 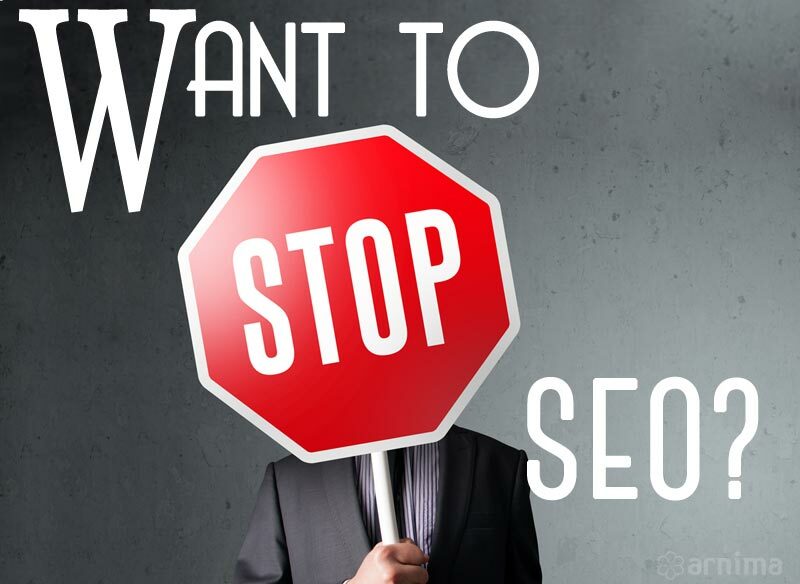 Should you stop SEO efforts on your website? It is actually a bit of a difficult question to answer. If you ask around, you will get different answers. Most SEO pros will say “never”. Some may say “it depends”. Very few will say “aah, sure, but make sure you really think about it”. It actually depends on several key factors. Let’s take a moment to look at each factor and its possible consequences before you make any decisions about your stopping SEO campaign. Search engine algorithms are continually changing and evolving as search engines work to provide what they call “the most credible experience” for their users. Here is a video posted on Google’s YouTube channel. The video is from back in 2011, but it is still relevant. You will see that Google made over 500 changes & adjustments (Google calls it improvements) to its ranking algorithms (the magical code-behind-the-scenes-that-determines-rank) in that year alone. That is almost 2 updates every single day! And these updates continue, day after day, year after year! “How does this affect my website?” you might ask. Unless you are directly and continually involved in the world of online marketing and SEO, you will probably not find out about these changes or updates as and when they happen. On the other hand, most online marketing professionals work hard to keep themselves aware of changes and updates that affect search results. This way, they are able to adjust, modify and update their SEO projects and campaigns quickly. Algorithm changes do not necessarily affect the rank of websites immediately. In fact, most changes may not affect the rank at all! But, then again, some of these changes may have a drastic effect. It all depends on what the algorithm updates are trying to accomplish. It also depends on how these changes and updates affect websites, including yours. It also depends, in lesser part, on how well your website is constructed, indexed and categorized. It is generally agreed that your website should provide the best user experience possible with relevant and meaningful content that engages your user and keeps them on your website. As a business owner, executive, managing director or decision maker, it is not your responsibility to keep on top of what is happening in the world of Internet marketing. Unless., of course, you really want to be. It is the responsibility of your Internet marketing team if you have one in-house, or your digital marketing company or agency to keep track of such changes and updates. By continually monitoring search engine ranking factor updates, your marketing team (in-house or outsourced) is prepared to adjust your SEO campaign(s) to make sure that your website continues to do well despite any potential negative effect as the result of these search engine algorithm changes and updates. There are two type of ROI we need to consider. The first ROI to look at is the number of leads your own website or services you hired (like https://www.roofengine.com/, etc) generate, how many of these leads convert to prospects and how many prospects go on to become paying customers. The second type of ROI is non-tangible i.e. it is not the number of leads, rather it is about the credibility of your business, organization, group or website – especially if you are trying to position yourself as a leader in your industry or sector. Why does this matter? It actually matters a great deal! If you say that you are a leader in your area of expertise but if you or your website does not rank in search results, do you not think that your credibility will be affected? Ongoing SEO is important if you care about your organization’s overall credibility! Let’s look at 2 examples. Acme Corporation has projected gross annual revenues of $5,000,000 for 2012. Their average sale is worth $10,000 and based on that, they need to close some 500 sales in 2012 to reach that number. Now, in their industry, the cost of each lead is about $100 and they typically convert 10% of the leads they generate. So, they will need to generate about 5,000 leads and at $100 per lead, their marketing cost will total $500,000 which is about 10% of their overall revenue. They have established that they generate some 50% of their leads from the Internet. Based on this, they have allocated a budget of $250,000 for Internet marketing. Of this total amount, they have allocated 50% to SEO and the balance to other Internet marketing activities such as social media, content marketing and more. Essentially, they have allocated $125,000 annually to SEO – a total of about $10,000 per month. As long as can generate at least 125 (or more) sales each month directly as a result of SEO, they will be good to go! 125 sales a month converts to 1,500 per year totaling $1.5M which is 25% of the gross revenues. Let us take a real life example. Let’s go to google.com and search for “cola beverage” or “cola drink”. You will fully expect to see Coca-Cola (or related websites) in the top 10 search results. If you did not, you would be pretty surprised. 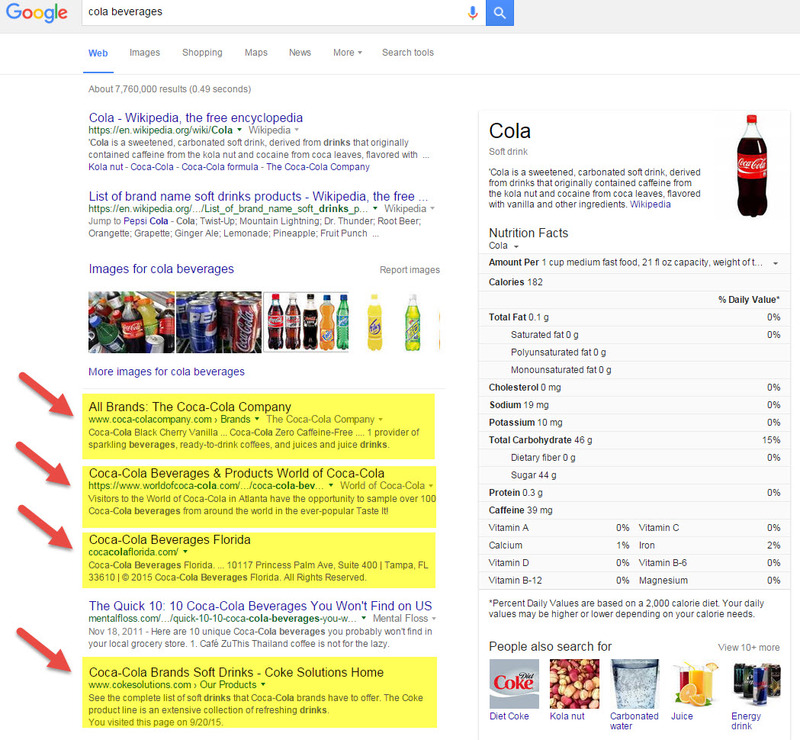 Does Coca-Cola need to actually get lots of “leads” or “customers” from the web? Not really. So, this rank is more about credibility than anything else. 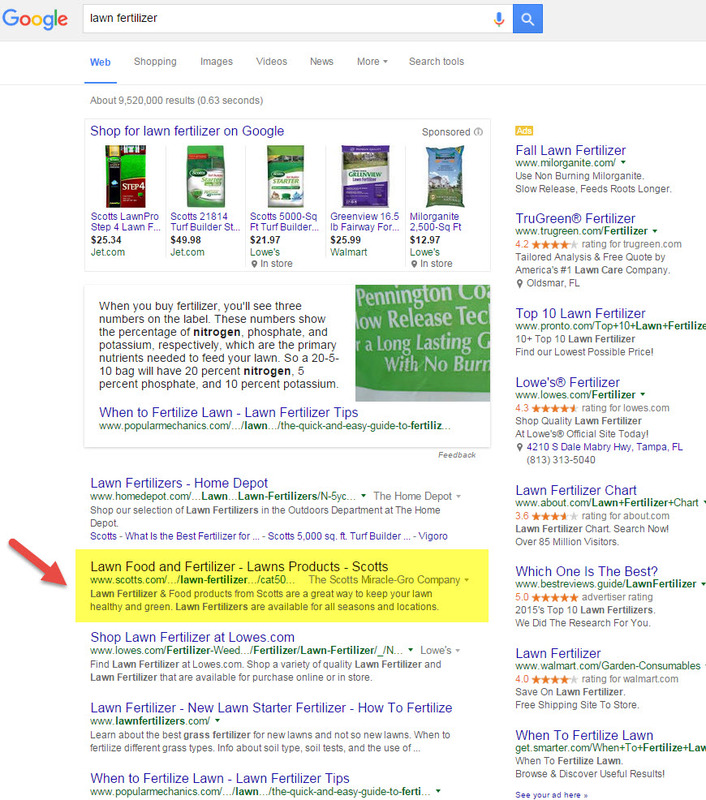 Similarly, take the example of “lawn fertilizer” – if you do not see the Scotts website pop up in the top 10 results, at least in the US, you may wonder. Again, this is about credibility. Remember, SEO is a strategic process – and therefore, it must be given effort, consideration, and time. Approaching SEO from a tactical perspective only is a mistake and will cost a significant amount of money with the potential of low return on investment (ROI). A detailed strategy will go a long way and will actually help you. There have been lots of changes in the SEO world over the last few years where the responsibilities of an SEO expert have evolved a lot and cost factors have increased accordingly. And if your SEO campaign has been running for some time, it is likely that you may have been grandfathered into your SEO company’s pricing structure. And if that is the case, they will probably work with you on price as it would be in their (and your) best interest to continue the relationship. So, before you stop your SEO be sure to look into current pricing – because, when you do go back to your existing vendor, or to a new vendor to re-start SEO (which is something that you will inadvertently need to do), there is a good chance that you will end up spending more, sometimes a lot more. Many of our customers have eventually restarted SEO. The longer they waited, the more time and effort it took to get their rank back up to where it was before they quit SEO. Not only did they lose opportunity when their rank dropped, they now had to spend more money to regain rank. If you stop your SEO efforts, do you think your competitors will “move” ahead of you on the search engines? Especially if your website is already ranking in the top 10 or top 20? If you check out LocalViking.com you’ll find out that when your rank drops, your competition will probably move up in rank or replace your position and they will start to attract traffic that was meant for your site to theirs! It may take a few weeks to a few months but if your competitors continue their online marketing activities, they will retain and even gain rank. And your leads. And your sales as well. Realize that this “loss” is intangible. Because it is something that you are not going to be able to measure. This applies in both cases: whether you generate leads, or whether you wish to establish credibility or both. The number of leads you generate will slowly decrease and your rank will also drop. And that is something you will be able to measure and also feel. So, stop SEO when your competitors quit their digital marketing initiatives. Your competition wants to make every effort to stay ahead of the game and it is quite unlikely that they will actually quit their SEO efforts. It is best to evaluate the value and outcome of your SEO efforts, whether done internally or outsourced, before making a decision to stop. Most companies do not arbitrarily stop their SEO efforts. Most will continue; some will divert funds into other digital marketing channels and others will increase SEO efforts to become more competitive and increase their presence on search engines. I highly recommend that you candidly and openly discuss your digital marketing goals and strategy with your Internet marketing company. Take the time to have a frank discussion with your SEO team before making any decisions that can ultimately have a detrimental effort. If you have stopped your SEO efforts, what has been your experience?